I got this recipe from Alicia Silverstone’s The Kind Diet. I tweeked it just a little and doubled the recipe since I am taking them to a Thanksgiving Party. I am very impressed and will be bringing them to many more parties. Line two 12 cup muffin tins with paper liners. Break the graham crackers into large chunks and put in a food processor. Pulse on and off until they are ground into fine crumbs. Measure out 1 1/2 cups of crumbs and set aside. Melt the butter in a small sauce pan over medium heat. Stir in the peanut butter, graham cracker crumbs and sugar and mix well. Remove the mixture from heat. Evenly divide the mixture, approximately two tablespoons per cup, among the muffins. At this point I put the muffin tins into my refrigerator. The directions have you immediately putting the chocolate on the mixture but my chocolate plopped all the way to the bottom when I did that. So I let the peanut butter mixture cool in the fridge for about an hour. At that point they should be firm enough to spread the chocolate mixture on the tops. Combine the milk and chocolate in another pan. Stir over medium heat until the chocolate has melted. Spoon the chocolate evenly over the peanut butter mixture. 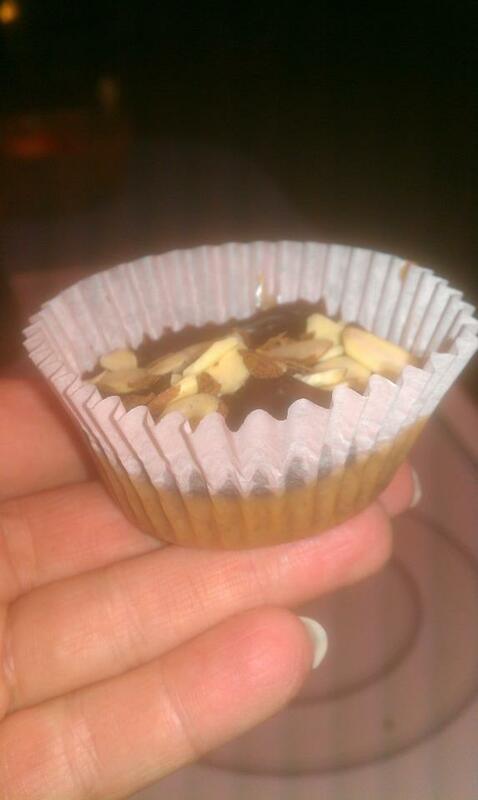 Top with chopped almonds. Place in the refrigerator to set for at least two hours before serving. I’ve tried these. They are amazing!